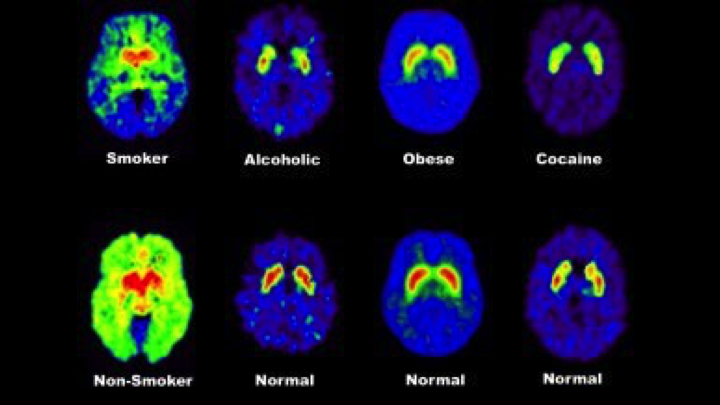 PET brain scans show chemical differences in the brain between addicts and non-addicts. The normal images in the bottom row come from non-addicts; the abnormal images in the top row come from patients with addiction disorders. These PET brain scans show that that addicts have fewer than average dopamine receptors in their brains, so that weaker dopamine signals are sent between cells. The Positron Emission Tomography - Computed Tomography (PET/CT) Scan may involve various organs of the body depending on the procedure being performed. Why is the PET/CT Scan radiology procedure Performed? There have been no recent advances in the PET/CT Scan procedure. What is the Cost of performing the PET/CT Scan radiology procedure? The cost of PET/CT Scan procedure depends on a variety of factors, such as the type of your health insurance, annual deductibles, co-pay requirements, out-of-network and in-network of your healthcare providers and healthcare facilities. How does the PET/CT Scan radiology procedure work? How is the PET/CT Scan radiology procedure Performed? The PET/CT Scan procedure is performed as an outpatient procedure, at a hospital. A radiology technologist performs the procedure under the supervision of a radiologist. The radiologist interprets the results of a PET/CT Scan procedure. A physician will request your consent for Positron Emission Tomography - Computed Tomography (PET/CT) Scan procedure using an Informed Consent Form. What are the Limitations of the PET/CT Scan radiology procedure? What is a Positron Emission Tomography - Computed Tomography (PET/CT) Scan procedure? What is to be expected during the PET/CT Scan radiology procedure? No anesthesia is used during the PET/CT Scan procedure. Since the scan is non-invasive, no blood is lost during the procedure. What are the possible Risks and Complications during the PET/CT Scan radiology procedure? Radiotracer material or contrast material used during the PET/CT Scan procedure may cause allergic reactions in certain patient groups. What Post-Operative Care is needed at the Healthcare Facility after the PET/CT Scan radiology procedure? No specific post-operative care is needed at the healthcare facility after the PET/CT Scan procedure. What is to be expected after the PET/CT Scan radiology procedure? If patients develop redness, warmth, pain, or swelling at the site of IV injection accompanied with high fever after the PET/CT Scan procedure, they should call their physician. What Post-Operative Care is needed at Home after the PET/CT Scan radiology procedure? There is no recovery time involved; patients may resume their normal activities immediately after the scan procedure. The PET/CT Scan procedure does not involve the removal of any body tissue. Since no tissue is removed during the PET/CT Scan procedure, a pathologist does not get involved in the care of the patient. Who will you receive a Bill from, after the PET/CT Scan radiology procedure? The patient is advised to inquire and confirm the type of billing, before Positron Emission Tomography - Computed Tomography (PET/CT) Scan procedure is performed.